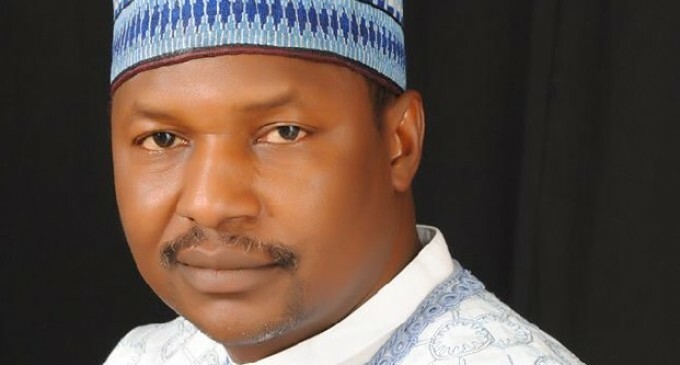 The office of the Attorney-General of the Federation (AGF) has disclosed how over $1.30million cash was recovered from the Abuja home of a member of the committee set up by President Muhammadu Buhari to investigate the procurement of arms and equipment in the Armed Forces, Air Commodore Umar Mohammed (retd). A lawyer representing the office, Shuaibu Labaran, said upon receiving intelligence, operatives of the Department of State Services (DSS) stormed Umar’s home, conducted a search and recovered $1,030,000 cash and other currencies. Labaran said some sensitive official documents (which he refused to name) and two pump action guns (marked: SBSG Magnum 397 and SBGS Interpress 09-1573) were also recovered at No: 4 Lungi Close, Mississippi, Maitama, Abuja. Labaran was making his opening remark, as the lead prosecution lawyer in the trial of Mohammed and his firm, Easy Jet Integrated Services Limited, before Justice John Tsoho of the Federal High Court, Abuja. Under the Administration of Criminal Justice Act (ACJA) 2015, a prosecutor is required, before the commencement of trial, to render an opening statement, containing a summary of his/her case against the defendant. Earlier, Labaran told the court that the prosecution had complied with its order for Umar’s release from DSS’ custody, having fulfilled his bail condition, following which he applied to make the opening statement. Lead defence lawyer Hassan Liman (SAN) confirmed Umar’s release. He said his client was released on December 2. Liman did not object to Labaran’s request to make an opening statement. Labaran said: “Following intelligence over a case of money laundering and unlawful possession of official documents and firearms, operatives of the State Security Service (SSS), armed with valid and subsisting search warrant, conducted a search in the premises of the 1st defendant (Mohammed). “During the search, large sums of money in different currencies and denominations, including $1,030,000 cash were recovered. “Investigation revealed that the said money was part of a transaction between the 1st defendant and the 2nd defendant (Easy Jet Integrated Services Limited), which offends relevant provisions of the Money Laundering Act, having failed to pass through any financial institution. “In the course of trial, the prosecution will lead evidence to prove these facts and tender exhibits recovered, and other evidence in proof of the charge pending before the court,” Labaran said. At the completion of Labaran’s statement, Justice Tsoho directed parties to agree on a convenient date for trial to open. Liman and Labaran agreed to return on February 14, next year. The judge adjourned till that date for the prosecution to open its case. Umar, 54, and his company, Easy Jet Integrated Services Limited, are being tried on a four-count amended charge of money laundering and unlawful possession of firearms and official documents. They are accused of conspiracy and accepting $1,030,000 in cash from a firm, Worldwide Consortium PTY Ltd, as payment for flight services without going through a financial institution as required by law. They have, by so doing, committed money laundering, contrary to sections 18 (a) and 16(1)(d) of the Money Laundering Act 2011 and punishable under Section 16(2)(b) of the Act. Umar was accused of being in possession of two pump action guns (marked: SBSG Magnum 397 and SBGS Interpress 09-1573) between June 1, 2011 and June 19, 2016 without valid licences and thereby committed an offence contrary to Section 4 of the Firearms Act 2004 and punishable under Section 27(1)(b)(i) of the act. He was also accused of having at his 4, Lungi Close, Mississippi, Maitama, Abuja home “classified/official documents without lawful authority and thereby committed an offence contrary to Section 1(1)(b) of the Official Secret Act and punishable under Section 7(1)(a) of the same Act”.